We survived to the weekend! Woohoo!! Any big plans for the weekend? For me, I am so happy to get my hair done, so first thing in the morning I get my roots touched up and a must needed trim. Boy do I need it, my roots are really showing! Eck! That’s scary!! After that maybe some shopping or I’ll just come home and relax, who knows? It’s suppose to be nice outside and I really should enjoy it, since the rain and cold weather is coming next week. Maybe I’ll finish working on my vegetable garden, but I really hate pulling weeds and these weeds have prickers. I also want to share with you that someone nominated my blog on Fitness Magazine under Healthy Eating Blogs. I am so excited, I almost fell over when I saw the e-mail. My first thought was Holy Crapper Dapper Doo’s!! O.M.G.!! Whoever you are thank you, thank you for nominating my blog!! I am so honored to have been nominated!! he he Now if you want to vote for me, I would so love that. Just go here. I also have a badge on the side of my blog, and you can just click that. Thank you for your support! I am having the time of my life blogging, it’s so much fun and I am so happy to have found something that I enjoy doing so much! The focus of the blog is to take everyday food and make it healthy. The blogger, 30-something Jennifer, has went through the battles of weight loss and now lives a healthy life with exercise and eating right. 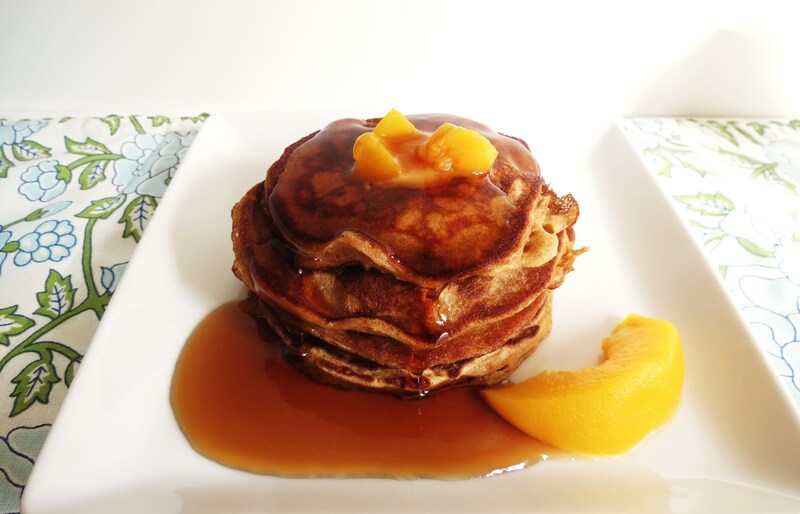 For today’s recipe it’s a wonderful healthy Peach Pancake Recipe. I have been having so much fun with buying and trying flavored yogurt. It’s helped me to come up with a new and creative pancake ideas and I got a new one I want to try out this weekend. Crossing fingers that it turns out! I have never had flavored yogurt until my friend Andrea (Hi Andrea!) had me try a Chobani Vanilla Greek Yogurt. I loved it and now I can’t get enough of all the flavors. Dam Greek Yogurt! I think I could live on the stuff, mix in some peanut butter and man am I in heaven! Now normally I don’t like peach stuff, except for fresh peaches because they normally make it way to sweet and it’s that fake sweet. Blah! But not Chobani Yogurt, it was perfect. It tastes like plain yogurt with fresh peaches added to it. I asked my Husband if he wanted to try the pancakes and he was not thrilled to hear they were peach, but he had them anyway and guess what? He loved them. These pancakes are not to sweet at all. 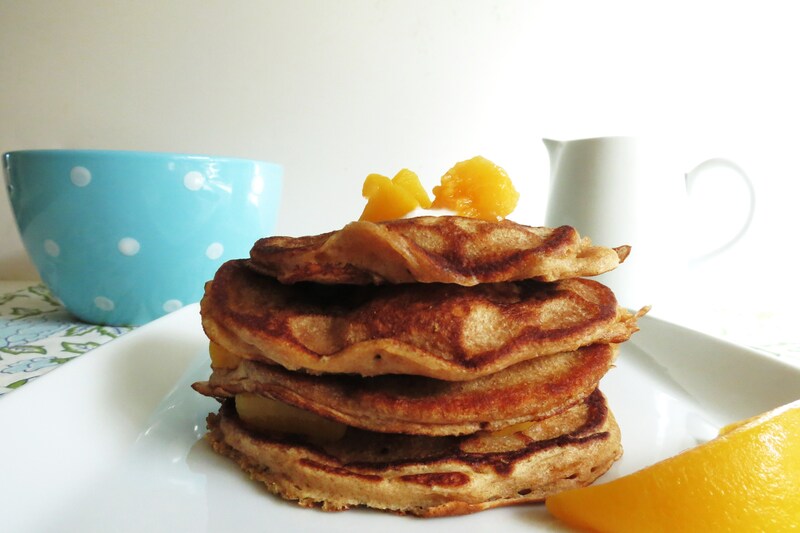 They tasted like light, fluffy, fresh peach pancake. Perfect! 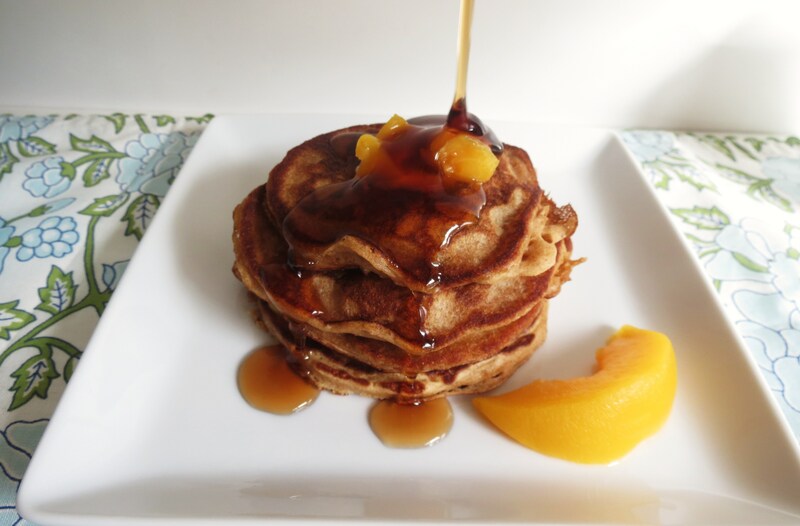 I used no sugar added canned peaches and rinsed them in water and cut them up and put them in the pancakes. The pancakes were popping with little peach pieces. 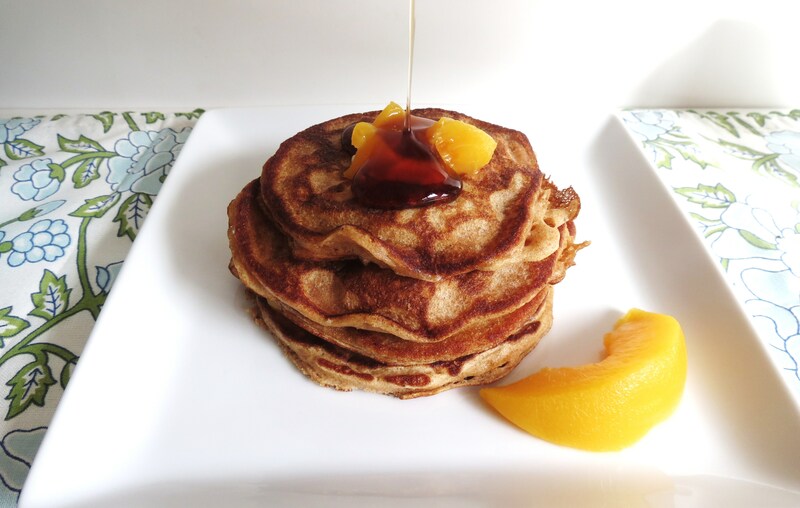 I just loved these pancakes and can’t wait to try them in the summer when peaches are in season. Sorry if it seems lately I have been on pancake overload. I have been enjoying making them on the weekend, and I really get satisfaction when my family loves them. 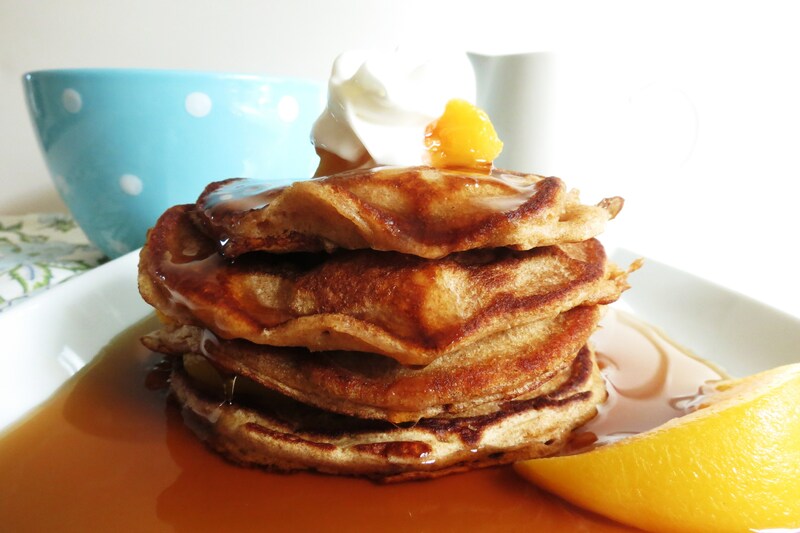 Pancakes are now the weekend tradition. Plus if I make extra they are so perfect for taking to work. As I mentioned before I just freeze them, take them out of the freezer in the morning and microwave for about 30 seconds and there as good as fresh. I think I’ll be making a double batch this weekend. My goal is to have 52 pancake recipes by the end of the year. I set weird goals for myself! QUESTION: What is your favorite kind of pancake? So far the ones I really like best is my Cherry Pancakes and the Strawberry Shortcake. I really love strawberries. My Husband favorites are the blueberry ones. Spray a non-stick skillet with cooking spray and place 1/4-cup batter onto skillet and cook till bubbles start appearing through the top of the pancake and then flip. NOTES: Cook on medium heat for about 1-2 minutes on each side. I add cooking spray to skillet between each batch. Notes: One 6oz container of yogurt worked for the whole recipe. I used Chobani Peach Greek Yogurt and Del Monte no sugar added canned Peaches. 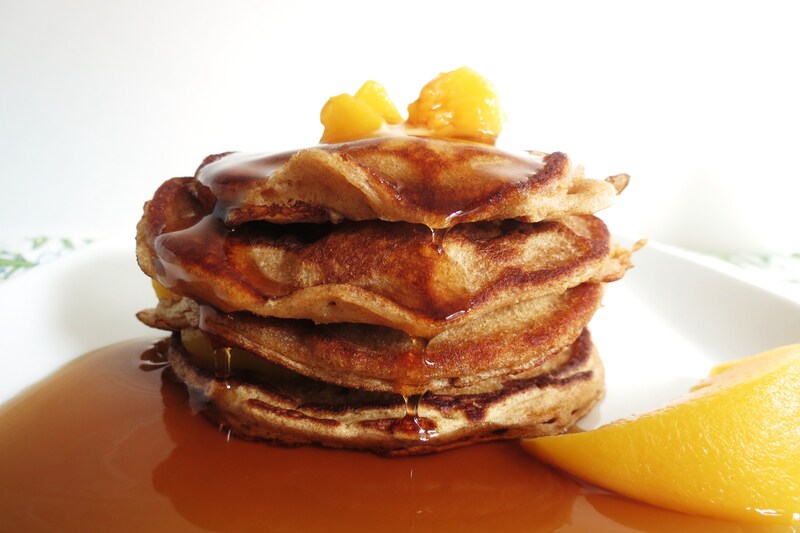 To keep pancakes warm, preheat oven to 200 and place the pancakes on a baking sheet lined with parchment paper. Place the pancakes on the baking sheet, but do not stack them. I wanted to remind you, don’t forget to enter my Peanut Butter Lovers Gift Pack Giveaway. The giveaway ends on Sunday at noon (PST). I’ll post the winner on Mondays blog. Also submit your Peanut Butter recipes! I want to see them all! Thanks for trying to vote for me. I think you can deny the subscription. I had to register and I don’t recall it asking me for a subscription. Congrats on the nomination 🙂 That is very exciting. 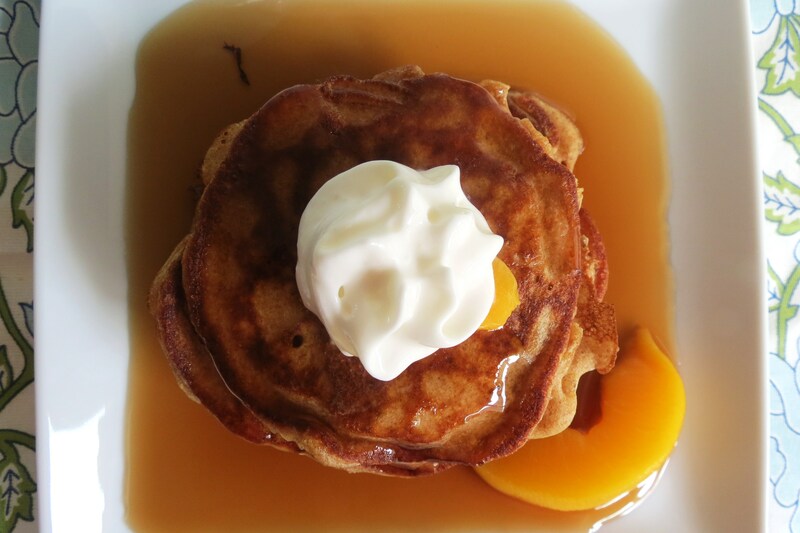 I love adding greek yogurt in my pancakes too, makes it creamy and adds protein. Btw, just wanted to let you know that your blog is loading very slow on my computer 🙁 I’ve tried loading a few times this week. Thank you! I wonder why it’s running slow? Sorry about that. 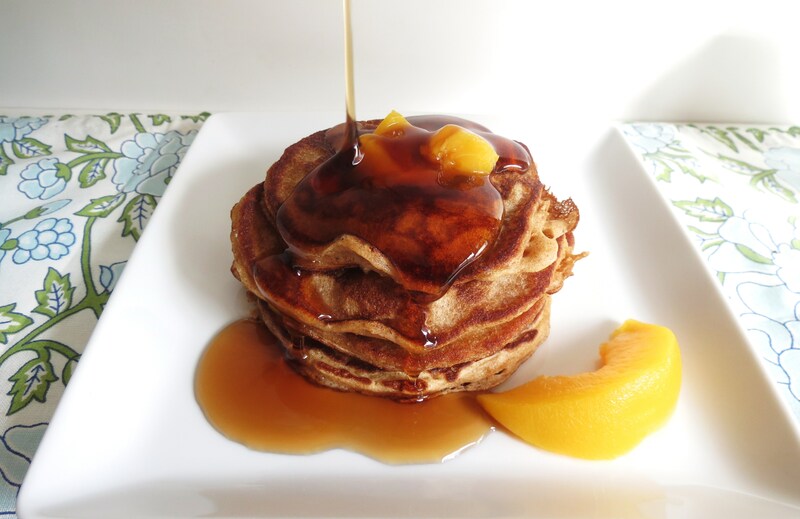 The pancakes look amazing! Congratulations on your nomination! It’s well deserved…your blog is terrific! I am totally a peach fan, anyway I can get them these look fantastic! 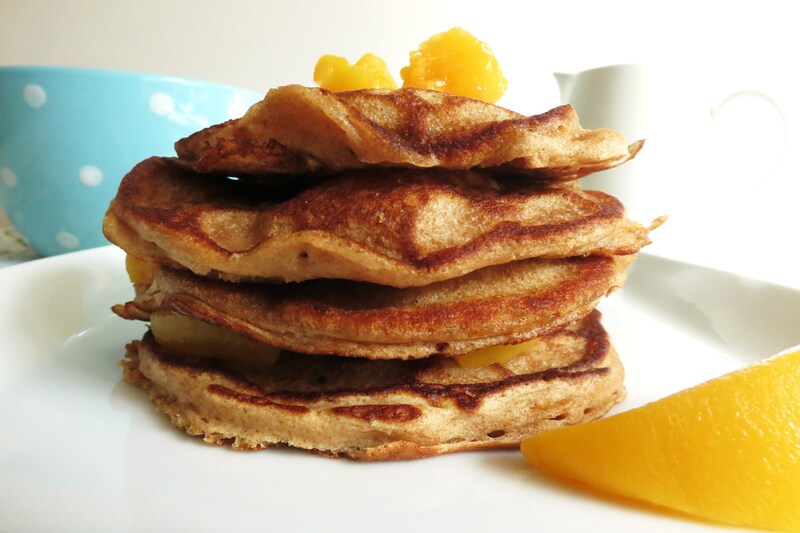 I just made these peach pancakes but with nectarines that were starting to get too ripe and I added 1/4 tsp cinnamon. They were the best pancakes I’ve ever had! So moist and delicious. Thanks for the recipe, girl! Oh my gosh I am so happy! Thank you for telling me! Love the idea of nectarines!! I have to try that! !